Well, this took me a while, I had a week off work to celebrate my birthday and reading a book about work was not high on my priority list. This book was also quite dry and crammed a lot of information into it, so it was not the easiest thing to read. 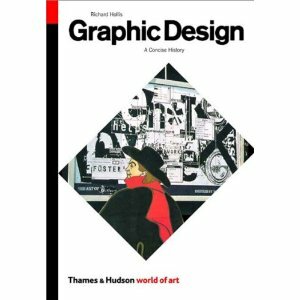 The book follows Graphic Design from the 1800′s to the late 1990′s. It starts with the change from Graphic Art to Design, and touches on Posters, Bauhaus, New Typography, the beginnings of design, the war and propaganda, the Avante Garde, Modernism, Futurism, Swiss style, Neue Graphik, 60′s, Psychedelia, protest design, and new technology, with everything in between. It mentions all the major players, and some that I hadn’t heard of, all the different big styles and movements and the major events of the the last 150 years and how they affected design (or vice versa). I bought this book at the beginning of my degree course to help in the theory side, and ended up buying/borrowing more books on each individual subject, but used this as a good starting point. It is also a good reference book to find out about designers from different eras, and styles, but the imagery is purely to help illustrate the points in the text and tend to be black and white thumbnails rather than full colour full page prints, so this is not a good book to pick up for some visual inspiration. A good reference book to start with, to help you find out more about the different styles and movements, designers and eras before going on to research in more depth.